The Denali Grizzly Bear is on the Nenana River forming the South boundry of Denali Park–just six miles south of the Denal National Park Visitor Center and shuttle bus station. 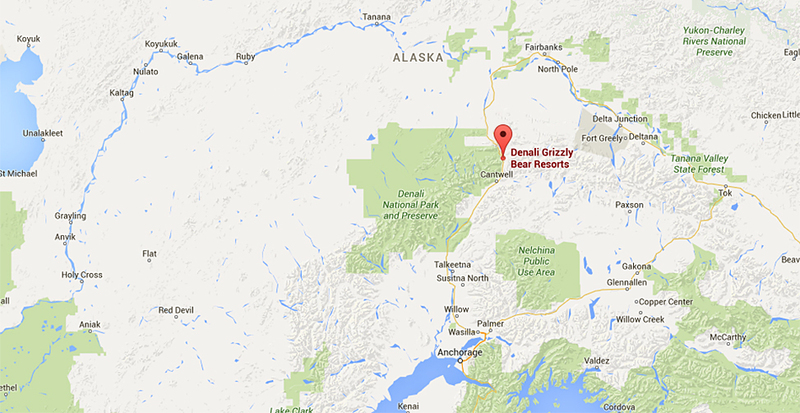 The Denali Grizzly Bear Resort	is located on the Nenana River forming the South boundry of Denali Park–just six miles south of the Denal National Park Visitor Center and shuttle bus station. We are at mile post	231.1 George Parks Highway (Route	#3). Approximate Distances: Denali Visitor Center (6 miles); Cantwell (15 miles); Fairbanks (130 miles - about 2.5 hours drive); Anchorage (225 miles - about 5 hours drive); Seward (350 miles). You see more golden eagles in Denali than bald eagles. Golden eagles are more likely to feed on ptarmigan, marmots and ground squirrels. Golden eagles arrive in Denali as early as March. They are called golden eagles not because of their body color (which is brown) but because of some light (golden) brown feathers on their head and neck. They have a wing span of about six feet and you can see them soaring in the wind or sometimes perched on a tree.